What we eat is supposed to be fun and happy – not the scary and the competitive sport it is being portrayed as on our television screens. Delving into my Mediterranean food roots has reminded me that at the end of the day, it really is all about flavour. Take simple good product, treat it well and enjoy the flavours. We all now live in a world of instant decisions and instant results where time is a precious commodity not to be wasted lightly. And I guess one of the biggest casualties of this is our food habits. Good flavour is the Holy Grail of cooking and takes time to search for and develop. So today’s recipe is an old French classic that looks complicated but is in fact easy to do. There are literally hundreds of recipes for cassoulet, which is in essence a simple bean and sausage casserole that can be dressed up with confit of duck – another case of the simple becoming the astonishing. I’ve included both recipes so you can choose how elaborate you want to make it. And before anyone mentions it, the quantities for the duck aren’t a typo – the confit of duck will last for weeks in the fridge as long as it stays completely covered by duck fat. So if you’re going to the trouble why not get more than one meal out of it? What could be finer than coming home from work on a dark winter’s night knowing you have a beautiful meal ready to go in the fridge? Drain and rinse beans and place in a large pan. Add pork belly, onion, 112g pork rind and bouquet garni. Cover with water, add salt and pepper to taste and bring to boil. Reduce to a simmer and cook for one hour until beans are tender. Allow to cool and discard onion and bouquet garni. Remove pork belly, cut into 5cm squares and set aside. Strain beans and rind and set aside, reserving cooking liquid separately. In a sauté pan, heat all but one tablespoon duck fat over medium-to-high heat until it simmers. Carefully add sausages and brown on all sides. Remove and drain on paper towels. Using same pan, over a medium-to-high heat, brown sliced onions, garlic and reserved cooked squares of pork rind from the beans. Remove from heat and transfer to blender. Add one tablespoon remaining duck fat and purée until smooth. Preheat oven to 180 degrees Celsius. Line the bottom of a deep ovenproof dish with the uncooked pork rind. Arrange all your ingredients in alternating layers, beginning with a layer of beans, then sausages, then more beans, then pork belly, beans, duck confit and finally more beans, adding a dab of the onion and pork rind purée between each layer. Add enough of the bean cooking liquid to just cover the beans, reserving one cup or 225ml in the fridge for later use. 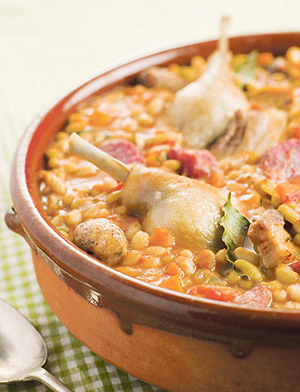 Cook the cassoulet in the oven for one hour, then reduce heat to 130 degrees Celsius and cook for another hour. Remove from oven and allow to cool. The next day, preheat oven to 180 degrees Celsius. Cook cassoulet for one hour. Break crust on top with a spoon and add ¼ cup/56ml of the reserved cooking liquid. Reduce heat to 130 degrees Celsius and continue cooking for another 15 minutes or until very hot. Serve immediately. Mix all marinade ingredients together and marinate duck legs for up to three to four days. Melt fat in a deep tray. Add marinated meat and cook in a pre-heated oven at 170 degrees Celsius for two hours. Check that legs are cooked, then allow to cool in the fat. At this stage, the confit will last weeks in the fridge, if kept covered in fat, ensuring a total air seal forms. When needed, simply remove from fat and cook under a high grill for about eight-10 minutes, or until the skin goes crispy.